$4.77 This item is selling for $4.77 on eBay. 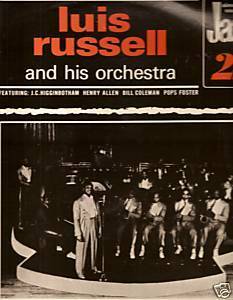 French CBS 63721 vinyl LP (1973) Luis Ruseell His Orch. Aimez vous le jazz 22 recorded 1929-30 Jersey Lightning/Feeling the Spirit/Doctor Blues/Saratoga Shout/Song of the Swanee/Give Me Your Telephone Number/It's Tight Like That//New Call of the Freaks/Panama/High Tension/Muggin' Lightly/On Revival Day/Louisiana Swing/Poor Li'l Me Vinyl is excellent; cover has slight creasing, cut corner.